Ever wonder how you can export Mozilla Firefox profile from one machine to another without the need to set them up manually? Occasionally you may need to do this especially when you are transferring or trying to setup a new machine with similar Firefox web browser profile setting and now with this tiny utility named as PortProfile, you can do this in simple steps. 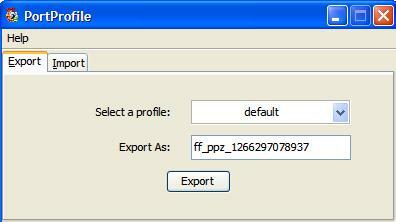 PortProfile is a java based application that being specifically designed for this purpose. It has a pretty simple GUI and without complicated setup required, users can start using it with self explanatory function tabs instantly. Basically it only consists of two tabs – Export and Import tabs that allow profiles to be exported first and eventually be imported back so that the exact profile can be cloned to any other machines, making the whole process as simple as possible. Depending on your file and configuration, it will take minutes to do the backup and compression (in .ppz format). And when it is ready, a “profile successfully exported” message will be shown with the selected profile ready to be restored in new machine. On the other end, these profiles can be restored with similar process but in reversed order as it will be uncompressed and added as new profile into new machine. The benefit is obvious, PortProfile allows all the add-ons, bookmarks and special configurations of Firefox web browser to be carried over and used in new machine that would otherwise take much hassle to be setup manually, not to mention about the inconsistency during the new system installation.